Some like the AR 15 for the great amount of accessories that you can get for it. As you use it mainly for self-defense or other tactical purposes, there’s a constant request for lights that you may mount on your AR. You do find home defense and patrol rifles that are already fitted with lights, but this doesn’t mean they all come equipped like that. 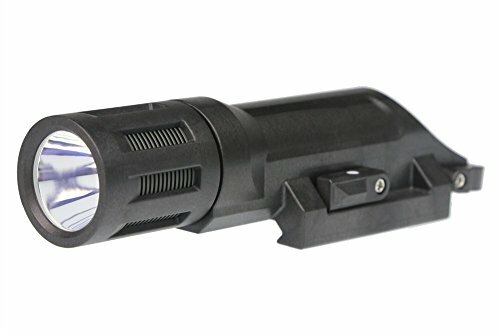 A simple flashlight for your AR just won’t do and an AR light should fit a specific description, as it’s not only the rugged build that’s important. You need a light that is recoil-proof as the effects of recoil to anything attached to a gun is always important. Many tactical flashlights are made from tough metal that handles very well the shock of many recoil. It wouldn’t hurt to also check the spring for the battery for defense against recoil. You want an AR light that is also long lasting and typical tactical flashlights are made of durable hard metal or something like that. You don’t want a flashlight that scratches or tear in middle of the fight. Your AR light should take a few drops and go through some battles with no scratches whatsoever! The brighter the light is, the more lumens you have on your light. Actually, it’s the other way around. if you’re using the light especially for sighting and accuracy, it’s not imperative for the LED lumens to be high. You should get something ranging from 200 to 500 lumens for your tactical missions. 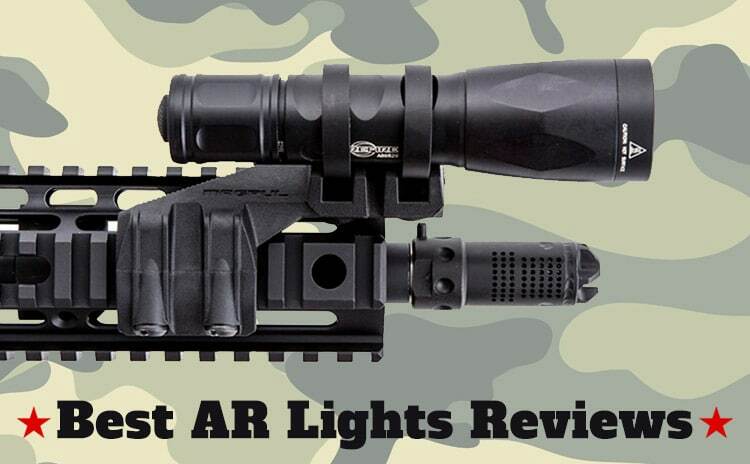 The specific features on an AR light are also important as some of them may give you more accuracy. A red laser, green lights should improve aiming, whereas some AR lights present also a special grip. Let’s not forget about comfort or the placement of the switch as you do want to use the light easy and fast all the time. All things considered, there are plenty of options to use as AR lights and you only need to keep the few tips in mind and check your wallet. It may get the final word when you’re deciding which model to go with. You don’t have to come back empty handed when you go shopping with only a few bucks in your wallet. You may still get a good deal with a flashlight like the CISNO New 1000LM LED Tactical Flashlight that is well made and gives bright light, considering its price. The flashlight presents a 6061T aluminum alloy anodic oxidation body and a flat black surface that minimizes reflective light. It gives 1,000 lumens, but doesn’t give as much heat as other led bulbs. The light is bright and reaches far. The design is efficient and the flashlight comes with two tail switches: the normal button switch and two modes remote switch. You may use constant on or temporary press on. It’s easy to mount the flashlight and the 1” ring 45 degree offset mount is great, especially when hunting. The flashlight is compact and powerful with a mount that is well made. It’s also waterproof, having an IP65 waterproof-level. Not only it’s easy to mount the flashlight, but it also comes with adjustable nuts and screws. No matter the minor drawbacks, we still like the flashlight for its good build and dependable light. Step out of the comfort zone and put your trust and faith in a rather low-priced flashlight like the Orion H40-W 500 Lumen LED Tactical Flashlight with Pressure Switch and Rifle Mount. The flashlight doesn’t surprise only with its bright light, but also with features and tough build. It comes with Cree XM-L U2 500 lumens LED so the light is very bright. When we take a better look at the features, we notice the constant on button switch and the momentary on pressure switch for various jobs. The flashlight incudes a Picatinny/ Weaver Rail mount so you may install it on rifles anytime. The body of the flashlight makes a good impression as it’s compact, recoil-proof and also water resistant. The flashlight is made if high-strength aerospace aluminum, taking well the heavy use and few drops. As for the lens, its water white glass lens with harden treatment, matching the rugged construction of the flashlight. The flashlight runs on two CR123 batteries or one 18650 battery. The switch isn’t very sensitive and the flashlight is fast and bright. It’s easy to mount, well-made and takes well recoil. Leaving the flaws behind, as they’re not major anyway, we really like the rugged flashlight as a great item to complete our gear. 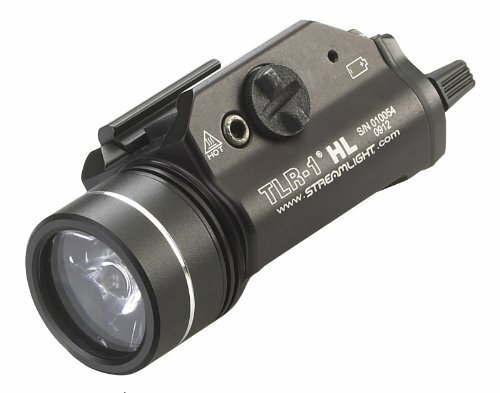 Easy to mount and build to last for a long time, the Streamlight 69260 TLR-1 HL Weapon Mount Tactical Flashlight Light 800 Lumens with Strobe is a great addition to your AR, no matter why you are using it for. The flashlight gives 12,000-candela peak beam intensity and the 800 lumens light sure help you see the way in the darkest night. We like the flashlight, as its interface is easy to Snap-On one-handed. You may keep your hands away from muzzle when attaching/detaching the light, which is always very helpful. The body of the flashlight takes some drops and challenging situations as it’s made with machined aircraft aluminum. The aluminum has an anodized finish with high temperature. The glass lens is shock-mounted, increasing the durability of the flashlight. As for the light per say, we notice the TIR optic that ensures a concentrated beam, with high peripheral illumination. The beam is nicely focused and the range is long. The wide beam patterns helps you identify what’s around you. We also like the ambidextrous momentary/steady on/off switch and the double tap momentary paddle for activating strobe mode. The strobe mode may be enabled/disabled quite easy. The flashlight is highly versatile and not only fits a nice range of weapons, but it also comes with keys for Glock-style, Beratta 90two, Picatinny, S&W99 and S&W TSW. The design is well thought out and the tethered battery door and latch mechanism lets you change easily the battery, minimizing risk for battery door loss as well. The flashlight may operate in difficult weather conditions, with a temperature ranging from -40 to +120F degree. It has an IPX& waterproof grade so you may submerse it to 1 meter for 30 minutes. For the good build, smart design and bright, focused light, the flashlight may be the last final detail for your AR. 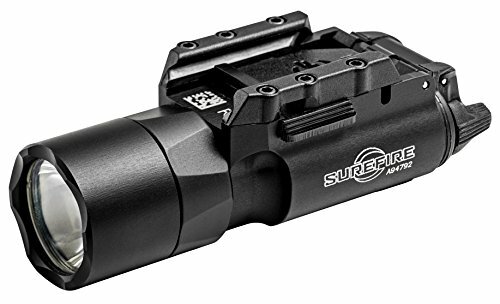 The tight beam and the wide range of the SureFire X300 Ultra Series LED Weapon Lights with TIR Lens recommend it as a good asset for your AR. The TIR lens of the flashlight ensure the nicely tight beam and give you a good range for the peripheral illumination. The flashlight includes plenty of features that are so useful when out there in the field. The one-finger ambidextrous momentary and constant on switching is ergonomic for easier use. The T-slot mounting system isn’t just built-in and made of aluminum, but also efficient for steady attachment to railed handguns and long guns. The flashlight is versatile, you may attach it to long gun with MIL-STD 1913 rails, and Surefire’s MR adapter mounts as well. The build of the flashlight is rugged and the body is made with strong aerospace aluminum and Mil-Spec anodizing. The coated, tempered window is also tough, completing the rugged build of the flashlight. The waterproof O-ring and the sealed gasket increase the durability of the flashlight that takes DG pistol grip and XT remote long gun tape switches as well. The built-in heat and fault protections and the wide temperature tolerance complete the heavy-duty construction of the flashlight. Lightweight and user-friendly, the flashlight is a dependable choice when in need. Despite the minor cons, for the tough build, yet lightweight body and the good light, the flashlight is worth every single penny. For general-purpose Surefire flashlights, see this article. Strong, yet so lightweight, the INFORCE WMLX Multifunction White LED 500 lm Weapon Mounted Light stands out from many options for all the right reasons. 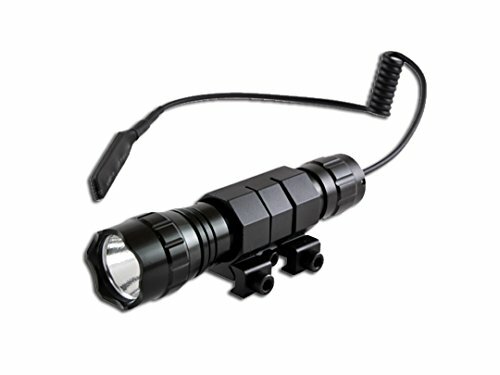 Not only is the light bright, but it’s also easy to mount and reliable in various tactical situations. The tactical rifle light is designed and made for the field missions and its white light (programmable) is so bright and reliable. The strobe is efficient and also easy to disable. The flashlight gives 500 lumens of light, with a tight beam for close to mid-range missions. You may use the peripheral light for covering a wide surrounding area as it’s very well balanced. The flashlight presents a two-lockout system- (1) rotate the head and (2) is the safety lever showing lockout position. 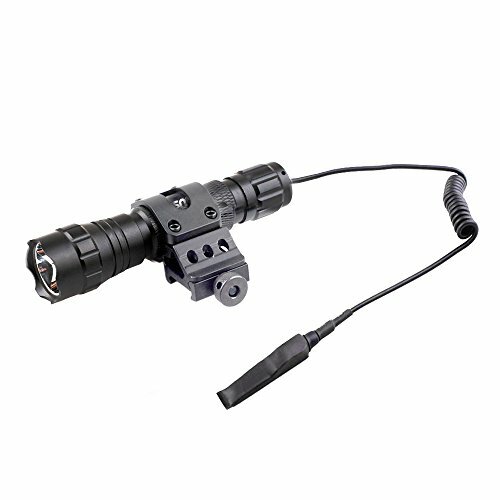 The built-in mounting system is compact and the flashlight is really easy and fast to detach. The angled activation button is easy to operate. The built-in rail clamping system isn’t just compact, safe and dependable, but also patent pending. As for the build, we notice the AR-coated high impact window that is waterproof up to 66 ft. and the long lasting, yet light fiber composite body. Let’s not forget to mention the easy-to-operate lockout systems that minimize the accidental discharge. Easy to use and strong, the flashlight is an option that you can’t go wrong with. The issues aren’t deal breakers for us and the flashlight remains a good investment of your money. It makes for a good option as a light for task force people.